Beat the Heat :-It prevents you from heat stroke, gives you an additional edge to fight the summer heat. This is perhaps due to the fact that it prevents our body from secreting excess salt and iron during sweating. Fight De-Hydration & Heat Stroke :-Staying hydrated, especially in the summers is very important and to do that one does need to drink a lot of water. 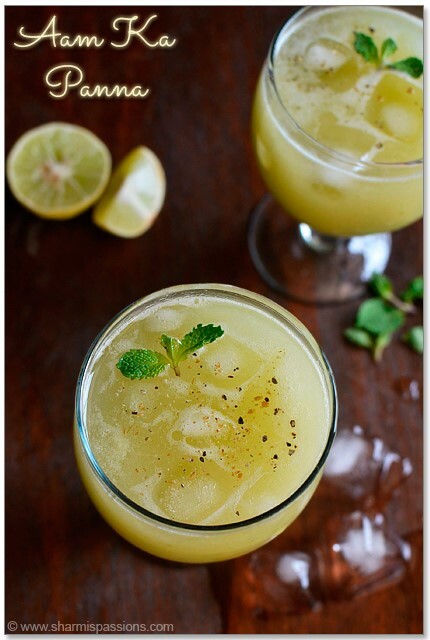 Apart from the water, aam panna is perhaps the best option you got. Very easy to make, a lot of water content and good taste. Vitamin-C :-It is rich in vitamin-C thus adding nutritional value with the other benefits, making this drink even more important. This feature also helps in boosting our immune system. Helps in Preventing Diarrhea :-The summer diarrhea is a cause of worry for many. However, this drink can help avoiding it. Keeping rehydrated, keeping salt and iron in the body, it also helps in preventing diarrhea. Indigestion and Constipation :-It helps in preventing a lot of such diseases and they are all connected with each other. Beat Anemia :-Being rich in iron, it can help you to fight against Anemia. Anti-Oxidants :-Anti-oxidants present in mangoes helps fight cancer. Improves Digestion :-Aam panna can fight the acids and keep your stomach cool, thus improving digestion.